Is there a way to restore a form that was changed inadvertently? I made changes to a form that I did not mean to change. Can I restore this form from a backup on your site? Thanks for your message. We'd be glad to assist you with this request. May we ask which form you would like to restore from our backup servers? A friendly tip: While editiing your form and accidentally made an unwanted change, you can use the Undo button to return to the previous state of your form. You can also right click on a form on My Forms page and then select "Clone Form" to create backup copies of your forms. We can try to restore the form. Please let us know the form ID. Please advise if this is what you need or if there is another form ID. The form name is good enough but we also need the time and date before changes to the form were made. Aytekin can look up your form and will try to restore it. 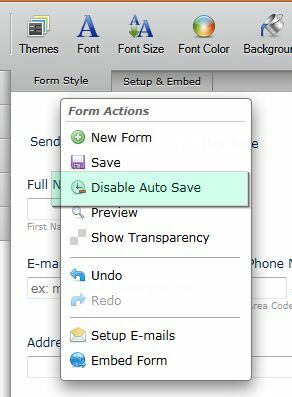 As a tip, you may also want to disable auto-save in your forms to avoid wanted saves. Please stand by for updates from Aytekin regarding the restoration of your form. Thank you for using Jotform. The form was changed yesterday, so if you can restore from Monday of this week or last week, that would be great. Unfortunately, because of our current incredible work load, we are not able to do the restore thing this week or next. It takes about half an hour manual work.